Having escaped from Czechoslovakia, Hanzlíček now had to escape from France and find his way to Britain. Along with other Czechoslovak pilots he managed to get to North Africa. On 9 July 1940 he sailed from Casablanca on the Royal Scotsman to Gibraltar, where he transferred to the David Livingstone, and on 21 July sailed for Cardiff where he arrived on 5 August 1940. This is the same route and day the other Czechoslovak pilot of the Merseyside Few, Jindřich Bartoš. He would join the same squadron as Bartoš six weeks later and was destined to share the same grave. It is not clear whether the men knew each other on the journey to Britain, or perhaps even whilst flying in France, but it’s easy to imagine that two Czechoslovakian pilots on the same long boat trip would find one another and have plenty to talk about. No 312 (Czechoslovak) Squadron came into being as the second Czechoslovak fighter unit in the RAF and was formed on 29 August 1940 at the Czechoslovak aircrew depot at RAF Cosford. The squadron’s motto was ‘non multi sed multa’, meaning ‘not many but much’. The squadron badge was a stork volant, a reference to the French ‘Escadrille des Cygelines’ with whom the original pilots of the squadron had flown prior to coming to the UK. 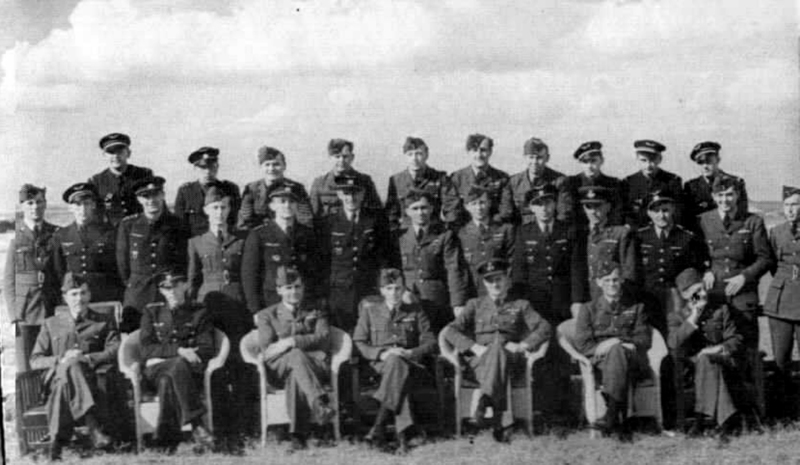 The home base of the squadron was RAF Duxford in Cambridgeshire, the same airfield where No 310 (Czechoslovak) Squadron was based. On 31 August the first nine used MkI Hawker Hurricanes were flown into Duxford and on 4 September 1940 a MkI Miles Master joined them. 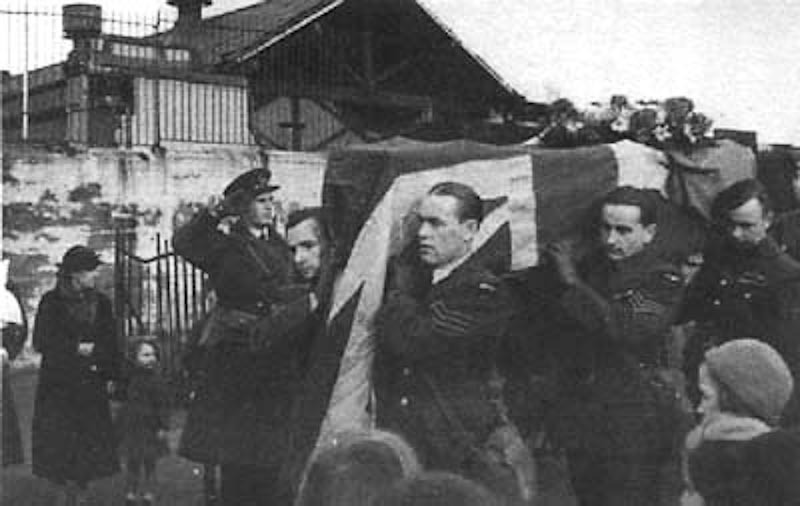 Czechoslovak airmen, including Jindrich Bartos, arrived at RAF Duxford with other Czechoslovak flying personnel and ground staff during afternoon of 5 September 1940. 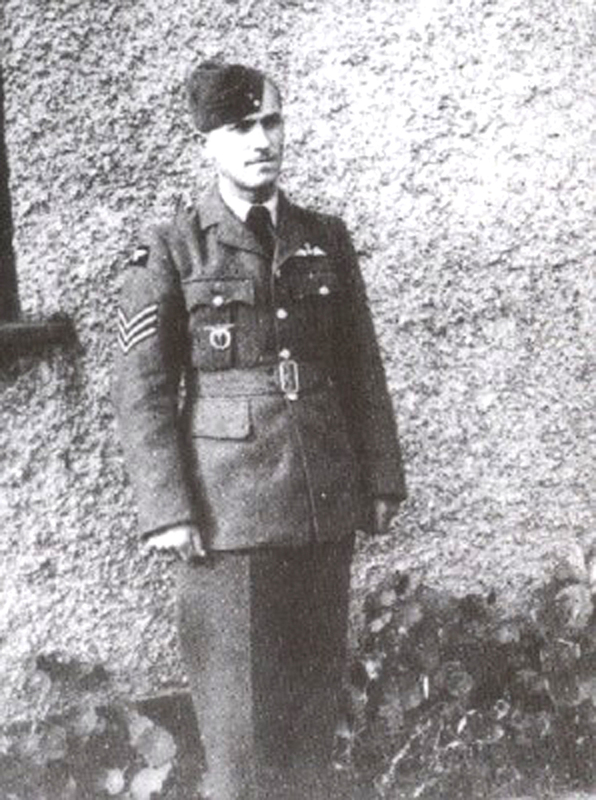 Otto Hanzlíček joined the RAF Volunteer Reserve and was given the service number 787697. On 19 September 1940 he was posted to No 312 (Czechoslovak) Squadron. Based around battle hardened pilots who already had combat experience in the Battle of France, many of whom with more than one victory, the squadron was ready for action. So it was on 26 September it moved to its new home, the RAF station at Speke, Liverpool [Google map]. Here the unit completed its retraining and in the last days of September obtained further Hurricanes. The squadron was allocated a number of older aircraft, something that caused many servicing difficulties. 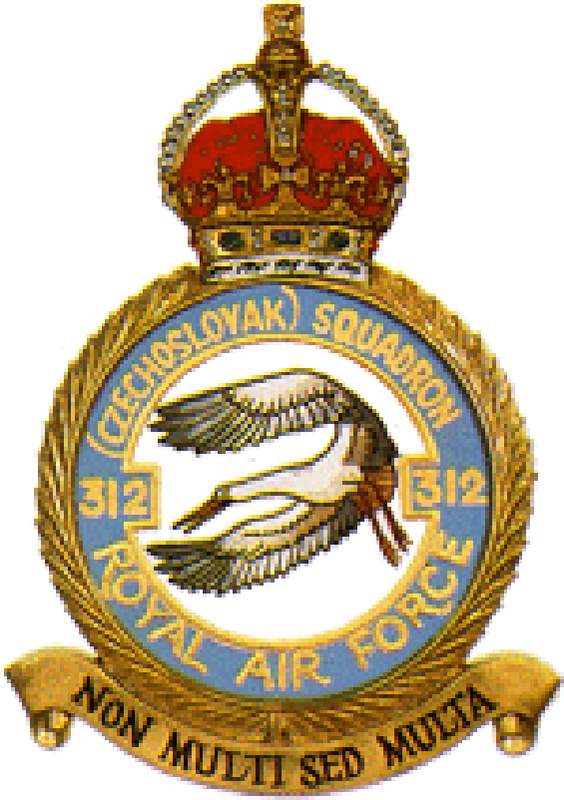 On 2 October 1940, No 312 (Czechoslovak) Squadron was declared operational and its task was to protect the Liverpool area from enemy raids. The squadron was most heavily involved in night patrols defending Liverpool docks. At 23:50 hours on 7 October Speke Aerodrome itself was attacked and an Audax aircraft was completely wrecked and a Douglas DF7 was damaged. Some windows in the hangars were broken, but the aerodrome remained serviceable although only half the squadron was operational. On 8 October 1940, pilots had shot down their first enemy aircraft, a Junkers Ju88 that had tried to attack the Rootes aircraft factory on the perimeter of the airfield. The factory manufactured Halifax bombers. The Ju88 crashed on the opposite bank of the River Mersey at Brombrough, on the Wirral. This victory was recorded as probably the fastest kill of the war, taking around eleven minutes from take-off to landing and was watched by Squadron personnel and many local residents. On 10 October 1940, Hanzlíček took off from Speke in the oldest Hawker Hurricane in service, L1547, along with Pilot Officer Dvořák on practice enemy aircraft attacks in the Liverpool area. As he banked round to return near Ellesmere Port on the opposite bank of the Mersey, less than three miles from Speke, the engine of his aircraft caught fire and he was forced to bale out near Oglet [Google map]. The wind blew him out over the River Mersey and, after problems with his parachute due to bailing out too low, he fell into the water, some 300-400 yards from the river bank bank and was drowned. He was seen to fall into the water on the North side of the river by a farmer near Oglet, but when he arrived at the river bank ten minutes later there was nothing to be seen. His aircraft came down into the river off the end of runway 08 and had been seen to be emitting smoke over the river just opposite the airfield by personnel at the station. Three weeks later, on 1 November 1940, Otto Hanzlíček’s body was found five miles to the east of Speke at Widnes. On 4 November the inquest into the cause of his death was held at Widnes [Google map], the finding of which was “Death due to Asphyxia from drowning”. At the age of 29, Sgt Hanzlíček was the first pilot to be killed from No 312 (Czechoslovak) squadron. At the time of the accident he had 930 flying hours to his credit, with seven of these on Hurricanes. On the morning of 5 November 1940 Hanzlíček’s funeral was held at the Roman Catholic Church in Allerton when, after a short service, he was taken to West Derby Cemetery. His coffin was draped with the Union Jack and Czechoslovak flags on which rested his Croix De Guerre. He was buried in Section RC11 grave No 392. The stone gives his name as Otta Hanzlíček. Jindřich Bartoš, the other Czechoslovak pilot in the Merseyside Few, and whose career was intertwined with Hanzlíček’s, was killed on 13 February 1941 whilst on a training flight. He was buried in the same grave as Hanzlíček, and they share a headstone. Sergeant Otto Hanzlíček is remembered on the Battle of Britain Monument in London, the Battle of Britain Memorial in Capel-le-Ferne on the white cliffs of Dover, a plaque at the RAF Museum at Hendon and a plaque at the Czech Club in London. Most recently there has been a street named after him in his home town of Ústí nad Labem, Hanzlíčkova [Google map]. Otto Hanzlíček was born in a fledgling nation, a liberal nation that should have allowed him to reach his potential and fulfil his ambitions. Such dreams destroyed, he was forced to flee his country. When the opportunity came to stand up to his oppressors he grasped it, going head to head with them in the skies above northern France. Pushed back again, he stood side by side with the young fighter boys of the RAF in defence of Great Britain. Posted to the North West of England, his job was to repel enemy raiders and help prevent an invasion. It was a job he gave his life for. 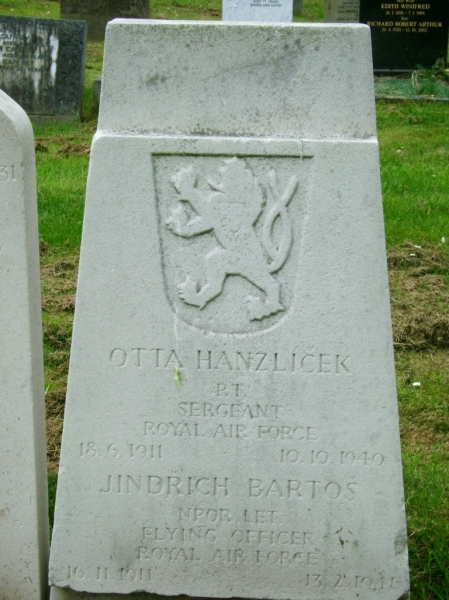 Otto Hanzlíček is buried on Merseyside because he gave his life defending it. For this the Merseyside Few is eternally grateful.